I’m currently in Trondheim, visiting my kids for Christmas. There are some opportunities here that I’ll exploit while I’m here. Suburban gardens has a lot of interesting plants and I hope the owners don’t mind if I take some seeds from them. The plants I’m especially after for my forest garden are sea buckthorn and burdock, both of which should do well in the climatic conditions back home. It’s been a very cold winter so far, appearantly looking like it’s going to sum up to be the coldest December in 110 years. 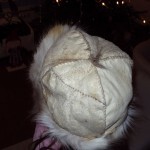 My wool cap was no longer adequate for the cold, so I made a fur cap inspired by Mongolian designs from some left over bits of reindeer skin. 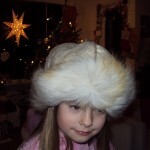 To show a bit of the pattern, I have my oldest daughter wearing it on some of the pictures. Also been coppicing a bit. 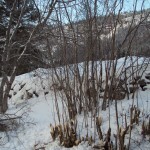 I coppice willow as mentioned before, but also hazel, birch, rowan, rose and guelder rose for various purposes. Not always deliberately, but I find myself returning to the same stands to take the new shoots. The hazel bush seen here had gotten too old to produce nuts well. The trees were also very tall, making harvesting difficult. So I chopped down all the ones that are not still light brown in the bark and in a couple of years they should start producing again. To keep vegative growth down and force it to produce nuts earlier, I will burn underneath the bush next spring and then every fall after that preceding the harvest. The reason why I want to burn right before the harvest is that it can be very difficult to find the nuts in the high grass. Hopefully this strategy will work. In the picture I have taken about half the stand to show you what I leave to grow and what I remove. I’m falling in love with fur clothing. Although my parka is of a pretty drafty design, it keeps me at the point of overheating even when doing light work in -20C! For January I have two plans: Trapping and making more clothing. And by the way: Merry Christmas! Nice hat! Is there a book that has these or similar designs in it? Didn’t see this in a book, but I made a pattern which pretty much approximates what I’ve seen on pictures. You need a piece of fur, sewn together in the middle (so the fur meets directions in the front middle, like two strips of a coyote back), that together is long enough to reach around your head, fur in. Your strip should be as wide as the maximum distance between the tip of your index finger and the thumb stretched out as much as possible. I made it too narrow this time, but next time I’ll use that measurement. Transfer the length of that strip onto a piece of string and divide it exactly by four. Don’t bother adding in for seams, the arches will add that onto the pattern. Using a compass (I substituted that with a piece of metal wire), take that distance and make two arches so you’ll have a same sided triangle. Now, make a third arch from the newly made crosspoint and you’ll have three arches meeting evenly. Elongate one end of the triangle with the length of your thumb and even out the two arches meeting there. I made them totally even sided and it rests too much on the top of the head because of it. The pattern should look almost like a traditional arrowpoint with convexly curved sides and base. Since the fur on the upper pieces will be hidden, you can use whatever direction you want. Stitch those four together first. Sew on the flesh side, I find the seam decorative to have on the outside. Then stitch on the headband, all fur in. If the patterns don’t match perfectly, crimp when needed. 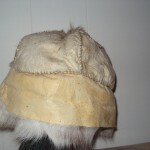 When done with the stitching, fold up the lower part of the fur so it becomes a ruff. I didn’t stitch it, since I want the possibility of deciding how far down the ears and neck I’ll have the ruff. But softer furs might fall down in the eyes, so then I’d make a seam in front to keep it at the appropriate hight. 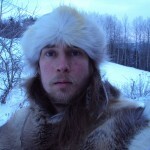 I let the fur stick out the top, imitating the horse hair top seen on some hats.